I am so excited about this crochet along! The response has been amazing!! So many of you have commented that you have never done a crochet along (a.k.a. CAL) before, and I am so honored that decided to join in. Let me assure you that there is nothing to be intimidated about and there is no pressure. We are here to have fun and make some new friends while challenging ourselves with a new project. This week we’re going to work on the large doll. If you missed the supplies list from last week, you can click here to find it. Click here to get all the patterns as they are released or just click on the links at the bottom of the posts to go forward or back one. If you need a reference for the stitch abbreviations, Reference Crochet Abbreviations here. Let’s go! Insert hook in next stitch, yarn overand pull up loop (2 loops on hook), insert hook in next stitch, yarn over and pull up loop (3 loops on hook), yarn over and draw through all 3 loops on hook. ✤✤ Each pattern is worked in a spiral. Place stitch marker on the last stitch of each round to mark the end of the round. Move marker up each round. ✤✤When starting each pattern, use your preferred method for making the ring, leaving a 6″ (15 cm) tail: (a) adjustable ring (single or double), or (b) chain 2, then start Rnd 1 in 2nd chain from hook. Finished doll measurements: bottom = 1¾” (4.5 cm) tall; top = 3¾” (9.5 cm) tall. Gauge = 10 sc and 10 rows = 2″ (5 cm) in sc stitch. Rnd 1: Sc 6 times into ring—6 sc, pm in last stitch of rnd, do not turn. Cont to move marker up each rnd. Rnd 2: 2 Sc in each of 6 sc—12 sc, do not turn. Rnd 3: *2 Sc in next st, sc in next st; rep from * around—18 sc, do not turn. Rnd 4: *2 Sc in next st, sc in each of next 2 sts; rep from * around—24 sc, do not turn. Rnd 5: *2 Sc in next st, sc in each of next 3 sts; rep from * around—30 sc, do not turn. Rnd 6: *2 Sc in next st, sc in each of next 4 sts; repeat around—36 sc, do not turn. Rnd 7: Working in back loops only, sc in each st around, do not turn. Rnd 8: * 2 Sc in next st, sc in each of next 5 sts; rep from * around—42 sc, do not turn. Rnd 9: Sc in each st around, do not turn. Rnd 10: * 2 Sc in next st, sc in each of next 6 sts; rep from * around—48 sc, do not turn. Rnds 11–13: Sc in each st around, do not turn. Rnd 14: *Sc2tog, sc in next each of next 6 sts; rep from * around—42 sc, do not turn. Rnd 15: Working in back loops only, sc in each st around—42 sc, do not turn. Rnd 16: Sc in each st around, sl st in next st, fasten off, leaving a 6″ (15 cm) tail. Weave in yarn tail. With color J, make a ring. Rnds 1–4: Rep Rnds 1–4 of bottom—24 sc, do not turn. Rnd 5: Working in back loops only, sc in each st around, do not turn. Rnds 6 and 7: Rep Rnds 5 and 6 of bottom—36 sc, do not turn. Rnds 8–15: Sc in each st around, do not turn. Rnd 16: Rep Rnd 8 of bottom—42 sc, do not turn. Rnd 17: Rep Rnd 10 of bottom—48 sc, do not turn. Rnds 18–20: Sc in each st around, do not turn. Rnd 21: Working in back loops only, sc in each st around, do not turn. Rnd 22: Sc in each st around, do not turn, sl st in next st, fasten off, leaving a 6″ (15 cm) tail. Weave in yarn tail. With color C, make a ring. Rnds 1–5: Rep Rnds 1–5 of bottom, sl st in next st, fasten off, leaving a 16″ (40.5 cm) tail. Yarn tail will be used to sew face piece to top. Row 1: 2 Sc in 2nd ch from hook, hdc in each of the next 2 ch, [sc2tog] twice, hdc in each of the next 2 ch, 2 sc in last chain—10 sts, ch 1, turn. st—11 sts, turn. Sl st in next st, fasten off, leaving a 16″ (40.5 cm) tail, which will be used to sew hair to face. Arrange hair piece placing foundation edge on face edge, and sew in place with yarn tail. With black thread and 2 large black beads, sew to face for eyes. Sew a smile with red thread. Cut two ½” (1.3 cm) circles (see diagram) of pink felt for cheeks. Sew to face with pink thread. Arrange embellished face with hair edge along Rnd 5 of top and sew in place. Embroider flowers below face and along edge following diagram for Large Doll; use daisy stitch for flowers, French knot for centers, and straight stitch for stems. Stitchy Nesting Dolls were designed by Amy Gaines and appear in Bara, B. (2013). Crochet at Home: 25 Clever Projects for Colorful Living. Interweave Press. Crochet along approved and pattern reprinted with permission from Interweave Press. Photography by Joe Hancock. Crochet at Home can be purchased from Amazon, Barnes & Noble, and Interweave. I wish this was on YouTube. 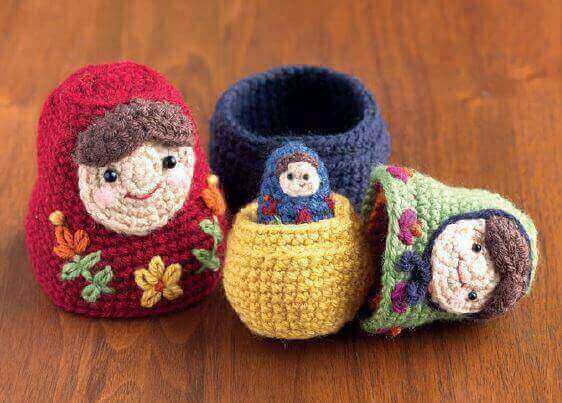 I can only crochet by videos 🙁 Beautiful work!! Love these dolls sooooooooooooooo much!!. Because it is easy to me to knit the doll by the pattern map. Could you please send a pattern map paper of the doll if it is found in my own email. Thank you so much for sharing by way of this CAL.I’ve never participated in one so this should be fun. My 3 year old granddaughter Emily loves these dolls. The hairdresser has a set of wooden ones that Emily plays with while having her hair cut. Now Grandma can surprise her with a set of her own for a birthday present in November. This is the CUTEST CAL ever! Love it! I love CAL’s, and matrioshkas, thank you for doing it!!! I have never heard of a CAL before. What is the premise? These are amazingly adorable! I saw this pinned on Pinterest by a friend. I think I know what I will be doing, times three, for my daughters. I think they would just flip over these! They are not little anymore, but would totally enjoy the dolls. CAL stands for crochet along and it is when a group of people work on a project together and share their pics, help each other through, etc. Feel free to join in at any time! Ah, so it’s like incentive to get it done, or just fun for people who already would. Great idea. We’ll see if I am able to keep up. It would be good to get this done soon, so I am not scrambling at Christmas like usual! Thanks for getting such a fun project going. So excited. This is my 1st CAL. Trying to use up some bits I have lying around. Started the bottom and ran out of the color i was using so mine are going to be striped i guess. Oh well. Each doll is unique no matter what. Started and finished this one last night. It was so much easier than I expected. I used different colors based on what I had around and she’s so cute! I’m in too! Gotta help my 16 yr old clean his room (if nobody hears from me…send help! Very excited, thanks for putting it together. Just finished the bottom! So far, instructions are very easy to follow! Is there a way you could post a picture with something to gauge how big the finished biggest doll is? Gauge is hard for me and mine just seems bigger than yours looks in the picture…. Thanks!! This is my 1stCAL! Excited! (4.5 cm) tall; top = 3¾” (9.5 cm) tall. I’m still working on mine so I can’t tell you how mine is measuring up. The picture on the post is from the book and are not my finished dolls. I will add the measurements to the post. Hope that helps! Thank You, Thank You, Thank You! Really looking forward to making these dolls! I’ve printed out my first set of instructions and can’t wait to get started! I have two little granddaughters that will love these for Christmas! Thanks for doing this. And thanks to Interweave Press for giving us permission. These dolls are SO CUTE!!! wow, thanks for sharing the pattern. Going to use red heart too. Should be fine, maybe a bit bigger.